I'm fighting back my withdrawal symptoms and in doing so trying to remember good times. What is your favourite live Ronan song/ or moment and where were you when it happened? Mine is Birmingham NEC the Long Goodbye the end bit asking if we were coming back again the crowd and myself screaming 'YES' and then he finished Guess i'm coming back again! Great atmosphere and left with the thought he'll be back!! Still patiently waiting. I've never told many people about this but he once wished me a happy birthday during a concert. That was very special. 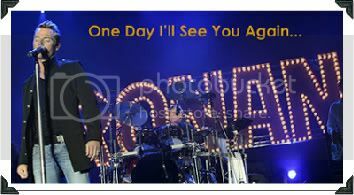 The long goodbye is always a special song, but I choose baby can I hold you in 2002 in Oberhausen. Why? We had been to the concerts in Munchen and Stuttgart the days before the concert in Oberhausen. In Oberhausen Arena it was veyr hot and I wasn't feeling 100% at the beginning of the concert. While singing baby can I hold you Ronan looked a bit worried in my direction and while singing the words baby can I hold you he reached out his hand to me. He did that fromj stage and he was to far away to take that hand, but it was was a very special moment. The way you make me feel will always be my favourite I guess... not only because he's shaking hands but because the lyrics describe the whole "concert experience" very well. Just what it feels like to be connected with him in that way. And the way he can make me so happy even though he doesn't really know who I am... you never try to please me but somehow you always do. I was lucky to see him twice (2007) so I'll take both those moments LOL!! Favourite live song - always Rollercoaster. I love it. It sounds amazing no matter how many times I hear it.